This very difficult intubation head, coupled with the CPR torso, supplies the challenges for initiating respiratory care to the critical patient. 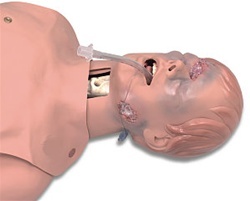 By using the features of tongue swelling and laryngospasm the instructor creates a critical airway management problem that requires the student to perform cricothyrotomy. In addition, two external and one internal bleeding wounds demand attention with suctioning and bleeding control. Size: 27" x 17" x 10"; Sh. wt. 14 lbs.